A good project Communications Management Plan ensures that you have effective communications throughout the life of your project. Everyone knows that 80% of a Project Manager’s time is spent communicating; therefore, to be an effective Project Manager you must have good communications skills. Our Communications Management Plan template helps you to think through the communication requirements for your project and plan for the most effective communications. This template is based on the communications guidelines according to the fourth edition of the PMBOK. How the information will be communicated—in meetings, email, telephone, web portal, etc. This Communications Management Plan sets the communications framework for this project. It will serve as a guide for communications throughout the life of the project and will be updated as communication needs change. This plan identifies and defines the roles of persons involved in this project. It also includes a communications matrix which maps the communication requirements of this project. An in-depth guide for conducting meetings details both the communications rules and how the meetings will be conducted, ensuring successful meetings. A project team directory is included to provide contact information for all stakeholders directly involved in the project. Approximately 80% of a Project Manager’s time is spent communicating. Think about it – as a Project Manager you are spending most of your time measuring and reporting on the performance of the project, composing and reading emails, conducting meetings, writing the project plan, meeting with team members, overseeing work being performed, meeting with clients over lunch and many more activities related to your projects. You should give considerable thought to how you want to manage communications on this project. By having a solid communications management approach you’ll find that many project management problems can be avoided. In this section give an overview of your communications management approach. The Project Manager will take a proactive role in ensuring effective communications on this project. The communications requirements are documented in the Communications Matrix presented in this document. The Communications Matrix will be used as the guide for what information to communicate, who is to do the communicating, when to communicate it and to whom to communicate. As with most project plans, updates or changes may be required as the project progresses or changes are approved. Changes or updates may be required due to changes in personnel, scope, budget, or other reasons. Additionally, updates may be required as the project matures and additional requirements are needed. The project manager is responsible for managing all proposed and approved changes to the communications management plan. Once the change is approved, the project manager will update the plan and supporting documentation and will distribute the updates to the project team and all stakeholders. This methodology is consistent with the project’s Change Management Plan and ensures that all project stakeholders remain aware and informed of any changes to communications management. All projects are subject to limitations and constraints as they must be within scope and adhere to budget, scheduling, and resource requirements. Project planning and documentation are no exception to this rule. There may also be legislative, regulatory, technology, or organizational policy requirements which must be followed as part of communications management. These constraints must be clearly understood and communicated to all stakeholders. While communications management is arguably one of the most important aspects of project management, it must be done in an effective manner and within the constraints of the allocated budget, time, and resources. All project communication activities will occur within the project’s approved budget, schedule, and resource allocations. The project manager is responsible for ensuring that communication activities are performed by the project team and without external resources which will result in exceeding the authorized budget. Communication activities will occur in accordance with the frequencies detailed in the Communication Matrix in order to ensure the project adheres to schedule constraints. Any deviation of these timelines may result in excessive costs or schedule delays and must be approved by the project sponsor. ABC Corp. organizational policy states that where applicable, standardized formats and templates must be used for all formal project communications. The details of these policy requirements are provided in the section titled “Standardization of Communication” in this document. ABC Corp. organizational policy also states that only a Vice President or higher level employee may authorize the distribution of confidential information. The project manager is responsible for ensuring that approval is requested and obtained prior to the distribution of any confidential information regarding this project. Most projects consist of a broad range of stakeholders all of whom may have differing interests and influence on the project. As such, it is important for project teams to determine the communication requirements of these stakeholders in order to more effectively communicate project information. There are a number of methods for determining stakeholder communication requirements; however, it is imperative that they are completely understood in order to effectively manage their interest, expectations, and influence and ensure a successful project. As part of identifying all project stakeholders, the project manager will communicate with each stakeholder in order to determine their preferred frequency and method of communication. This feedback will be maintained by the project manager in the project’s Stakeholder Register. Standard project communications will occur in accordance with the Communication Matrix; however, depending on the identified stakeholder communication requirements, individual communication is acceptable and within the constraints outlined for this project. In addition to identifying communication preferences, stakeholder communication requirements must identify the project’s communication channels and ensure that stakeholders have access to these channels. If project information is communicated via secure means or through internal company resources, all stakeholders, internal and external, must have the necessary access to receive project communications. Once all stakeholders have been identified and communication requirements are established, the project team will maintain this information in the project’s Stakeholder Register and use this, along with the project communication matrix as the basis for all communications. The project sponsor is the champion of the project and has authorized the project by signing the project charter. This person is responsible for the funding of the project and is ultimately responsible for its success. Since the Project Sponsor is at the executive level communications should be presented in summary format unless the Project Sponsor requests more detailed communications. The Program Manager oversees the project at the portfolio level and owns most of the resources assigned to the project. The Program Manager is responsible for overall program costs and profitability as such they require more detailed communications than the Project Sponsor. Normally Stakeholders includes all individuals and organizations who are impacted by the project. For this project we are defining a subset of the stakeholders as Key Stakeholders. These are the stakeholders with whom we need to communicate with and are not included in the other roles defined in this section. The Key Stakeholders includes executive management with an interest in the project and key users identified for participation in the project. The Change Control Board is a designated group which is reviews technical specifications and authorizes changes within the organizations infrastructure. Technical design documents, user impact analysis and implementation strategies are typical of the types of communication this group requires. You should identify the customer if the project is the result of a solicitation. In such a case, the customer will be involved in reviewing prototypes, approval of designs and implementation stages and acceptance of the final project the project generates. The customer for this project is . As the customer who will be accepting the final deliverable of this project they will be informed of the project status including potential impacts to the schedule for the final deliverable or the product itself. The Project Manager has overall responsibility for the execution of the project. The Project Manager manages day to day resources, provides project guidance and monitors and reports on the projects metrics as defined in the Project Management Plan. As the person responsible for the execution of the project, the Project Manager is the primary communicator for the project distributing information according to this Communications Management Plan. The Project Team is comprised of all persons who have a role performing work on the project. The project team needs to have a clear understanding of the work to be completed and the framework in which the project is to be executed. Since the Project Team is responsible for completing the work for the project they played a key role in creating the Project Plan including defining its schedule and work packages. The Project Team requires a detailed level of communications which is achieved through day to day interactions with the Project Manager and other team members along with weekly team meetings. The Steering Committee includes management representing the departments which make up the organization. The Steering Committee provides strategic oversight for changes which impact the overall organization. The purpose of the Steering Committee is to ensure that changes within the organization are effected in such a way that it benefits the organization as a whole. The Steering Committee requires communication on matters which will change the scope of the project and its deliverables. The Technical Lead is a person on the Project Team who is designated to be responsible for ensuring that all technical aspects of the project are addressed and that the project is implemented in a technically sound manner. The Technical Lead is responsible for all technical designs, overseeing the implementation of the designs and developing as-build documentation. The Technical Lead requires close communications with the Project Manager and the Project Team. The following table presents contact information for all persons identified in this communications management plan. The email addresses and phone numbers in this table will be used to communicate with these people. Many times, the methods and technologies used to communicate are just as important of a consideration as the information being communicated. Imagine a large project with many stakeholders who all have different technological capabilities. Some may have access to a share drive while others do not. Some may have access to video teleconferencing and others only have telephone and email capabilities. In order to be effective, project information must be communicated to everyone involved by some method using available technology. Determining communication methods and what technologies are available should be part of determining stakeholder communication requirements. The project team will determine, in accordance with ABC Corp. organizational policy, the communication methods and technologies based on several factors to include: stakeholder communication requirements, available technologies (internal and external), and organizational policies and standards. ABC Corp. maintains a SharePoint platform within the PMO which all projects use to provide updates, archive various reports, and conduct project communications. This platform enables senior management, as well as stakeholders with compatible technology, to access project data and communications at any point in time. SharePoint also provides the ability for stakeholders and project team members to collaborate on project work and communication. For stakeholders who do not have the ability to access SharePoint, a web site will also be established for the project. Access to the website will be controlled with a username and password. Any stakeholders identified who are not able to access SharePoint will be issued a unique username and password in order to access the web site. The project manager is responsible for ensuring all project communications and documentation are copied to the web site and that the content mirrors what is contained on the SharePoint platform. ABC Corp. maintains software licenses for MS Project software. All project teams are responsible for developing, maintaining, and communicating schedules using this software. PERT Charts are the preferred format for communicating schedules to stakeholders. The project schedule will be maintained on both the SharePoint platform and the project website. All project communication and documentation, in addition to being maintained on the SharePoint platform and project website, will be archived on the internal ABC Corp. shared drive which resides in the PMO program directory. Organizational naming conventions for files and folder will be applied to all archived work. The following table identifies the communications requirements for this project. – Meeting Minutes – Soft copy archived on SharePoint site and project website. – Project Schedule – Soft copy archived on SharePoint site and project website. Flowcharts provide a visual representation of a process or processes which often allow a better understanding of how the process is intended to work. Project communications may be extremely complex depending on the size and scope of the project and the number of stakeholders. A flowchart provides all stakeholders with a better understanding of the steps involved with the distribution of all project communications. 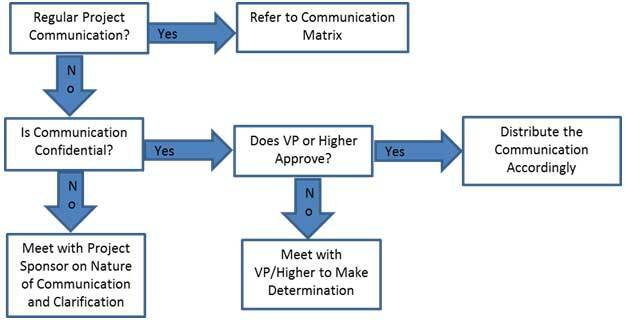 The communication flowchart below was created to aid in project communication. This flowchart provides a framework for the project team to follow for this project. However, there may be occasions or situations which fall outside of the communication flowchart where additional clarification is necessary. In these situations the Project Manager is responsible for discussing the communication with the Project Sponsor and making a determination on how to proceed. Meeting Agenda will be distributed 5 business days in advance of the meeting. The Agenda should identify the presenter for each topic along with a time limit for that topic. The first item in the agenda should be a review of action items from the previous meeting. Meeting minutes will be distributed within 2 business days following the meeting. Meeting minutes will include the status of all items from the agenda along with new action items and the Parking Lot list. Action Items are recorded in both the meeting agenda and minutes. Action items will include both the action item along with the owner of the action item. Meetings will start with a review of the status of all action items from previous meetings and end with a review of all new action items resulting from the meeting. The review of the new action items will include identifying the owner for each action item. The Chair Person is responsible for distributing the meeting agenda, facilitating the meeting and distributing the meeting minutes. The Chair Person will ensure that the meeting starts and ends on time and that all presenters adhere to their allocated time frames. The Note Taker is responsible for documenting the status of all meeting items, maintaining a Parking Lot item list and taking notes of anything else of importance during the meeting. The Note Taker will give a copy of their notes to the Chair Person at the end of the meeting as the Chair Person will use the notes to create the Meeting Minutes. The Time Keeper is responsible for helping the facilitator adhere to the time limits set in the meeting agenda. The Time Keeper will let the presenter know when they are approaching the end of their allocated time. Typically a quick hand signal to the presenter indicating how many minutes remain for the topic is sufficient. The Parking Lot is a tool used by the facilitator to record and defer items which aren’t on the meeting agenda; however, merit further discussion at a later time or through another forum. A parking lot record should identify an owner for the item as that person will be responsible for ensuring follow-up. The Parking Lot list is to be included in the meeting minutes. Standardization is a proven way to simplify the complexities of project management communications. Many organizations develop and use standard templates or formats for the various communication tools used throughout projects. Standard templates and formats may be applied to certain types of project meetings or specific types of communication (i.e. emails, status reports, etc.). By using standardization, organizations can help ensure that its project teams and stakeholders have a thorough understanding of what is expected and achieve consistent and effective communications. In addition to standard templates and/or formats, organizations may standardize file naming or sharing conventions. An organization may use SharePoint or some other type of Web Portal/Network tool (blogs, message boards, etc.) as a standard platform from which to share information and communicate. Additionally, an organization may have standard file naming conventions for their stored data on their internal share drives. Many of these tools and new technologies are used in today’s projects with team members and stakeholders often spread over wide geographic areas. Standardization provides a level of simplicity to an organization’s communication platforms and improves effectiveness and efficiency. Kickoff Meeting – project team will utilize ABC Corp. standard templates for meeting agenda and meeting minutes. Additionally, any slides presented will use the ABC Corp. standard slideshow template. Project Team Meetings – project team will utilize ABC Corp. standard templates for meeting agenda and meeting minutes. Additionally, any slides presented will use the ABC Corp. standard slideshow template. Technical Design Meetings – project team will utilize ABC Corp. standard templates for meeting agenda and meeting minutes. Additionally, any slides presented will use the ABC Corp. standard slideshow template. Monthly Project Status Meetings – project team will utilize ABC Corp. standard templates for meeting agenda and meeting minutes. Additionally, any slides presented will use the ABC Corp. standard slideshow template. Project Status Reports – project team will utilize ABC Corp. standard templates for meeting agenda and meeting minutes. Additionally the standard project status report document, available on the share drive, will be used to provide project status. Informal project communications should be professional and effective but there is no standard template or format that must be used. As issues or complications arise with regards to project communications it may become necessary to escalate the issue if a resolution cannot be achieved within the project team. Project stakeholders may have many different conflicting interests in a given project. While escalations are a normal part of project management, there must be a documented process that defines how those escalations will take place. Efficient and timely communication is the key to successful project completion. As such, it is imperative that any disputes, conflicts, or discrepancies regarding project communications are resolved in a way that is conducive to maintaining the project schedule, ensuring the correct communications are distributed, and preventing any ongoing difficulties. In order to ensure projects stay on schedule and issues are resolved, ABC Corp. will use its standard escalation model to provide a framework for escalating communication issues. The table below defines the priority levels, decision authorities, and timeframes for resolution. ** NOTE: Any communication including sensitive and/or confidential information will require escalation to VP level or higher for approval prior to external distribution. Communication The effective sending and receiving of information. Ideally, the information received should match the information sent. It is the responsibility of the sender to ensure this takes place. Stakeholder Individuals or groups involved in the project or whose interests may be affected by the project’s execution or outcome. Communications Management Plan Portion of the overall Project Management Plan which details how project communications will be conducted, who will participate in communications, frequency of communications, and methods of communications. Escalation The process which details how conflicts and issues will be passed up the management chain for resolution as well as the timeframe to achieve resolution.